11/4/09 – Acquisitions – Tokyo, National Museum of Western Art – Inaugurated in 1959 in a Le Corbusier building, Tokyo’s National Museum of Western Art was first constituted of a private Japanese collection . It has since then added some remarkable works, focusing on major European artists from the 16th to the 19th centuries : among the old masters, there is an early work by Veronese acquired in 1994, The Mystic Marriage of Saint Catherine, as well as, in 2003, a Saint Thomas by Georges de La Tour, related to the apostles’ series in Albi. The last canvas to enter the Tokyo museum, in 2008, was a bozzetto preparing the cupola of the church of San Felice del Benaco, on Lake Garda, representing The Glorification of Saint Felix and Saint Auductus. On the art market for several years, this painted study came up at Agnew’s, after having been presented at Sotheby’s as the Holy Trinity with Angels . The author of this composition, Carlo Innocenzo Carlone (1686-1775), was one of the Northern Italian artists who stood out in the 18th century for a Rococo style, light and monumental at once, which spread in the German countries thanks to travellers. In fact, Carlone’s career, initiated in Lombardy, can be compared to that of the Venetian artists Piazzetta and Tiepolo : born near Como where he received his training, the artist spent most of his early youth in Venice, then Rome to perfect his studies under Francesco Trevisani. Except for a few portraits and easel paintings with historical subjects, Carlone mainly produced ambitious decorative compositions, both secular and religious, in Italy as well as elsewhere in Europe. After a stay in Ratisbon, he worked in Vienna for Eugene of Savoy, where he painted in 1716 a Glorification of the Prince in the lower Belvedere before decorating the upper Belveder in 1721-1723. 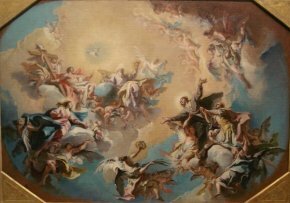 Also in Linz and Ludwigsburg during these same years for religious compositions, in 1727 Carlone executed a cycle of frescoes at the Clam Gallas palace in Prague. His activities in the German region also led him to Ansbach where, like Tiepolo in Würzburg, he adorned the residence with compositions glorifying the local prince. This was his last major production outside of Italy, before returning to settle in Lombardy in 1735. Carlone then pursued the same type of career, with important works for the Duomo in Monza between 1739 and 1745, as well as mythological and allegorical frescoes in the Palazzo Martinengo Salvadego in Brescia, in 1739. Extremely active in churches in Lombardy, Carlone executed frescoes for the Duomo in Assissi between 1767 and 1779, probably his last accomplishment. His painted works can also be found in various museums which own preparatory studies for his mural paintings . Dating from around 1759 , the Japanese study thus belongs to a late stage in his career, with a very delicate harmony of colours and a superb mastery of spatial effects. Ever faithful to the precepts promulgated by the Council of Trent, Carlone signs here a composition which is both expressive and understandable, where the two martyred saints triumph in the kingdom of heaven . The combination of atmospheric effects and formal prowess recalls the greatest 18th century Italian examples of religious decoration, such as The Glorification of Saint Cecilia by Sebastiano Conca in Santa Cecilia di Trastevere in Rome (1721-1724) or Tiepolo’s frescoes in the Venetian church of the Gesuati (1737-1739), both of which Carlone probably saw on his travels. When looking at the artist’s oeuvre, stylistic parallels can be drawn with contemporary bozzetti : thus The Last Supper and The Triumph of Knowledge in Ca’Rezzonico in Venice, comparable in their gestural language and chromatic accords, or else The Triumph of Wisdom at the Ashmolean Museum in Oxford, of a similar vein although bolder. This acquisition by the National Museum of Western Art in Tokyo joins a small but interesting holding of the Settecento, not often well represented in major public collections outside of Italy. The museum already held in fact a Virgin and Child with Three Saints by Giandomenico Tiepolo and, notably, by his father Giambattista a study of The Apotheosis of the Admiral Vettor Pisano, in preparation for the large fresco executed in 1743 on one of the ceilings of the Palazzo Pisani Moretta in Venice . The Matsukaka collection is one of the important ensembles of Western art brought together by wealthy Japanese art lovers in the early 20th century. Held in France during World War II, the collection was then returned to its home ; however, France received some works in 1959 as a result of the peace settlement with Japan. Thus the Musée d’Orsay holds The Peasants of Flagey (1850, on deposit at the Musée des Beaux-Arts et d’Archéologie in Besançon) by Courbet, The Waitress with Beer Glasses (1878-1879) by Manet, The Bedroom in Arles by Van Gogh (1889) and also The Atelier by Schuffenecker (1889), Still Life with Fan (around 1889), Landscape in Brittany. The David Mill (1894), Vairumati (1897) by Gauguin. Sotheby’s, London, 3-4 December 1997, lot 210. Agnew’s seems to have identified the subject correctly. The Musée des Beaux-Arts in Strasbourg owns a Mucius Scaevola before Porsenna, related to the décor of the Villa Colleoni in Calusco d’Adda, not far from Bergamo, dated 1737 (cf. Béatrice Sarrazin in Settecento Le siècle de Tiepolo Peintures italiennes du XVIII siècle exposées dans les collections publiques françaises, pp. 70-71). As for the decoration itself, it is generally dated between1759-1761. Formerly celebrated on 30 August in the Catholic liturgical calendar, Felix and Aductus died in around 303. Having refused to renounce his Christian faith, Felix was tortured on an easel, then sentenced to be beheaded : on the road to Ostia, another Christian came out to meet him, declared his faith and was killed at the same time as Felix. As Felix’ companion remained anonymous, he was given the name Aductus, the Latin for “added” since his martyrdom was added to that of Felix. Acquired respectively in 1987 and 1988.